Wood River Valley youths will have the chance to enjoy a genuine theater experience this spring with the St. Thomas Playhouse. For its 10th anniversary season, St. Thomas Playhouse will stage "Footloose the Musical!" from June 22-25 at the Community School Theatre in Sun Valley. Auditions for high school youth and young adults will be held Saturday, May 14, from noon to 4 p.m. and Sunday, May 15, from 1-3 p.m. Auditions will be conducted on a first-come, first-served basis in the downstairs parish hall at St. Thomas Church, 201 Sun Valley Rd. Also, St. Thomas Playhouse will perform "The Music Man" from Oct. 13-16 at the nexStage Theater in Ketchum. Community members from 5 to 95 years old are invited to audition on Monday, May 16, from 4-7 p.m. and Wednesday, May 18, from 4-7 p.m. in the downstairs parish hall at St. Thomas Church. Back for the fourth year, the Summer Performing Arts Conservatory Camp will be held at the safe and creative environment of Camp Perkins, north of Ketchum near Alturas Lake in the Sawtooth Mountains, from June 27-July 3. The sleep-away camp is for 10- to 18-year-olds who have a passion for the performing arts and are motivated to participate in intensive study in acting, drama, music, singing and many forms of dance. Campers can play in a rock band, too. The unique camp is a St. Thomas Playhouse program. Several valley performing arts professionals teach the campers each summer. St. Thomas Playhouse also hires guest artists from around the nation who have careers in the performing arts. For 2011, guest artists include James Martin from Mississippi for voice and music, Mary Kennedy from New York City for dance, and Kevin Wade, also from New York City, for acting and musical theater. All of the faculty and guest artists have vast experience in teaching young people. Camp Perkins on Perkins Lake along Alturas Creek Road is surrounded by pine and aspen trees. Campers sleep in bunk cabins with a young adult counselor in each cabin and have their meals in a large dining hall overlooking Perkins Lake. The campers spend mornings in classes and afternoons participating in swimming, kayaking, rock climbing, hiking, volleyball, arts and crafts or private lessons with faculty. 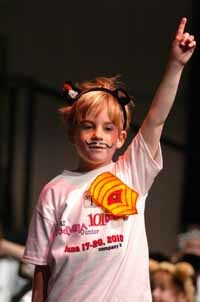 "Camp is the most amazing experience," said St. Thomas Playhouse Managing Director Cherie Kessler. "The faculty is incredibly talented and the creative growth for the kids is phenomenal." Evenings are filled with fun activities including skit night, movie night, DJ and dance night, and a talent show. Highlight of the final day of camp is a showcase performance for families and friends of campers in the Great Hall in the main building. Camp is $900, which includes professional instruction but not private lessons, counselor and staff compensation, the camp facility and meals. Scholarships are available on a first-come, first-serve basis. There is also an early bird discount for campers who register before May 1. Sibling discounts are also considered. For more details and to register, call Sara Gorby at 726-5349 or e-mail sgorby@stthomassunvalley.org. As part of the St. Thomas Playhouse 10th anniversary season, the performing arts day camp for children and youth, Company B, will present "Seussical, the Musical, Jr." for family, friends and the entire community. The two-week camp begins Monday, June 13, in the parish hall at St. Thomas Church on Sun Valley Road in Sun Valley. The second week of camp will take place at the Community School in Sun Valley where the musical show will be staged. All children and youth from 4-13 years old are invited to attend and participate in all aspects of the musical production. The campers will audition and then be assigned roles in the musical. For two weeks, campers learn the fundamentals of theater, learn and rehearse lines, songs, dances and staging, help with costumes and present the show, "Seussical the Musical, Jr." at the Community School Theatre in Sun Valley. Those dates are June 23-25 at 2 p.m.
Campers from 4-7 years old will attend camp from 9 a.m. to 12:30 p.m. New this year is the Company B Club, an optional afternoon daycare until 3 p.m. where the younger children can participate in activities, arts and crafts, and story time. Youth from 8-13 years old will continue with rotations and rehearsing for the show until 3 p.m.
Company B costs $350 for ages 4-7, and $475 for ages 4-7 with Company B Club daycare. Company B for ages 8-13 costs $475. St. Thomas Playhouse has the H. Edward Bilkey Memorial Scholarship Fund for children and youth who need partial financial assistance to attend Company B. Scholarship forms are now available. For a brochure, registration form, scholarship form and more information, contact Sara Gorby at 726-5349, or sgorby@stthomassunvalley.org.